TO DANCE FOR "60 YEARS"
The Dan O'Day Dance Club is an exciting club concept offering expert dance instruction plus a variety of Dance Programs and Memberships to fit every budget. As a school, we teach you to dance with the best of them. As a club, we provide you with the best of them to dance with. A Word About Our Club: We welcome you to join our exciting Dance Club! Our clients have a wonderful time enjoying a great pastime. You can be part of this, it's easier than you think. 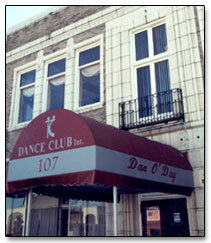 Membership at Dan O'Day's Dance Club entitles you to membership facilities during regular working hours. Please see our About Us page for membership and club offerings.